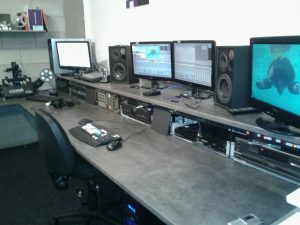 Our professional AVID edit suites are compatible with most popular video file types and we can render output files for use on all devices or platforms or create DVD’s for distribution. Titles, graphics, pictures and other material can be included to finish the production. We have a small royalty free music library, use of which is included in the basic price. We can also work with video clips from most smart phones and devices. There are a few things you can do to reduce the cost. A pre determined list of clips and shots for inclusion with timings will greatly reduce the amount or time needed to complete the edit. Clients are welcome to sit in on the edit process. A story board or script is essential to ensure the edit suite time is kept to a minimum. The more information we have to work with, the easier the edit will be. If possible have tapes cued at their start points. If you are looking for a one stop solution to your video transfer, conversion and video editing service – Contact us today to discuss your video editing requirements.